Chatime Malaysia has expanded a lot. Now with over 30 branches nationwide, you can enjoy your Chatime almost anywhere! I admit, I’m not exactly adventurous when it comes to drinks, so I usually go with a normal Pearl Milk Tea. I’ve tried their Hazelnut Milk Tea, their Macha Red Bean Ice Blended and their Grass Jelly Milk Tea. 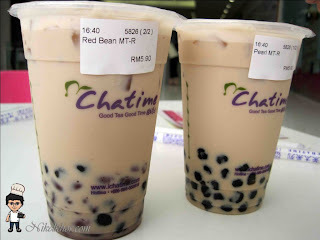 My all time favourite is still the Pearl Milk Tea though. One of the main reasons why I’m reviewing this brand of tea is because they have excellent customer service! Their Facebook page used to be flooded with complaints of their bad quality-control in some of their branches, and I think they resolved the problems, for the page is pretty much empty nowadays except for their updates of new branches opening. When I went out with my friend Carmen the other day, I ordered a Large Pearl Milk Tea, 70% sugar and 30% ice. They gave me 70% ice and 30% sugar. You’d think that wouldn’t be that bad? It was. It was diluted and not sweet at all! Just out of curiosity, I e-mailed a feedback e-mail to their feedback service. They replied very courteously and asked me to come back so they could prepare another FOC drink for me. All I had to do was go back to the same outlet, quote my name to the supervisor, and I got my complimentary drink! I’ve never had any other problems except the one mentioned above. What’s great about Chatime is that it the prices aren’t crazy! It’s pretty reasonable for an aromatic cup of tea! Usually it’s around RM5.90-RM6.90, depending on the size, the flavour and your toppings! Delicious and affordable! When you buy your Chatime, they’ll give you a receipt with a receipt number. There’ll be a neon—or something like that anyways—sign which will have numbers on it. Wait till your number is being flashed on said sign, go to the collecting counter and enjoy your cup of tea! Many people are afraid of drinking bubble tea or eating the pearls/jelly due to many rumouring health issue problems. Well, if you do some research, you can find videos of Chatime making the jelly or pearls, and they’re pretty authentic and albeit not super duper healthy, they don’t kill and aren’t that bad. This video addresses the health and customer service. Many consumers has complained that the Chatime Ai Yu Jelly has plastic in it, when it really is the layer of jelly on the surface after they cool it. Completely edible. They made this video to address this matter. In the meantime, enjoy your Chatime!